With summer coming to an end and school right around the corner, for some it has already started, we’ve been thinking about School Bus and School Zone Safety. If you or someone you know will have to contend with these zones regularly and would like a “refresher” on school bus safety, we have an online training course that will help keep them more aware and everyone safer in these zones. Below are a few of the basic defensive driving techniques for the areas around school buses and school zones. 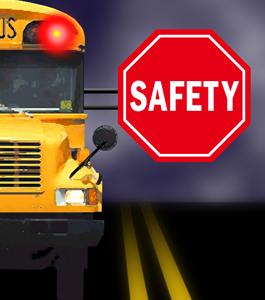 Learn and obey the laws pertaining to school buses and school zones. Pay special attention to laws in effect while the lights are flashing. Yellow flashing lights indicate that the bus is preparing to load or unload children. Red flashing lights and extended stop arms indicate that the bus has stopped and children are getting on or off. Slow down when driving through school zones or following a school bus. Stay Alert! Know your local school zone speed limits. Be patient; if you travel during pick up and drop off times then expect minor delays for school buses. Remember that school buses make frequent stops. Children are unpredictable; they take more risks and ignore the hazards in their environment. Understand that children are easily distracted. Pay special attention to younger children. Never pass a school bus on the right. This could lead to serious consequences. Remember, it’s against the law to pass a stopped school bus while its lights are flashing. We take customer safety very seriously, and Ryder offers several free customer safety training courses to help keep you, other drivers, and pedestrians all more safe on the roads.